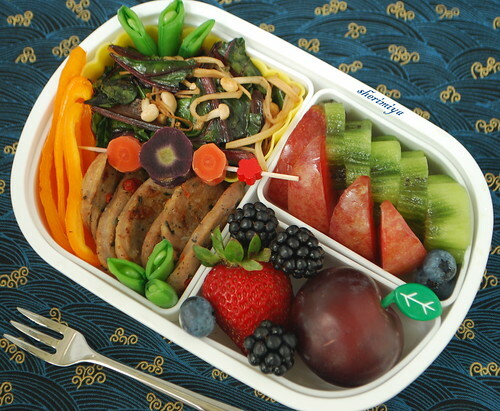 Sausage, Pepper and Chard Bento, originally uploaded by sherimiya ♥. Today's bento is an example of a non-cute healthy bento that is all-age appropriate. I didn't take extra time for cuteness, but I think the variety of colors and textures in this one make up for it. Everything was cooked in the same pan: chicken sausage, yellow capsicum, and swiss chard / enoki. The chard and enoki got pan-fried in the sausage drippings, and then sprinkled with garlic powder. Pretty simple and tasty. I added some steamed sugar snap peas and a purple / pink carrot skewer for quick decoration. In the fruit sections I placed sliced kiwi and plum, a strawberry, blueberries, blackberries and another tiny plum that I thought looked so cute! Everything sealed up nicely with the translucent cover. Isn't it colorful? Linked up at What's For Lunch! How about you? Yeah chard! I love when a bento has a full range of color, I feel like I am doing something right! O wow! Love the colors in the bento!!! It's my first time with swiss chard! So happy to include a superfood into our repertoire. Totally agree about the color satisfaction too. Thanks! Yum,yes please! Always healtht and pretty. You make it look so easy. Thanks a lot Debra and Lia! The nice variety colours of this bento already did a good job, you don't need any extra cuteness at all! Colorful with beautiful hint of fall tones in this radiant bento. 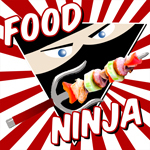 That pretty skewer makes me happy! Rainbow chard with enoki cooked in drippings is a fantastically flavorful notion, yum! I agree with Chantale. Your kawaii bentos are wonderful, but the color and variety you include in the non-cute ones is also really fantastic! Yum yum yum. Thanks so much Yenny, KidsDreamWork, bentobird, OhayoBento, tatabonita, Kris, Chantale and Sonoma Bento! I'll very likely be going back to more "standard" bento like these in the coming school months. I do like the grown-up attractiveness of the food by itself. i have to disagree with you a little bit: this is still cute! it's a perfect example, though, of how someone interested in cute touches can just purchase a few inexpensive packages of picks. no detailed cutting required, just stick 'em in -- and as you said, use colorful and appetizing food -- and it's ready-made cute! Agree about the picks, which is why I have such a pick obsession! Thanks for your positive words, megan!